Made with organic rice and specially selected ferments, our yoghurts are very low in fat and sugar, and come with all the probiotic goodness associated with conventional yoghurt. All our products are vegan and completely free from gluten, soy, nuts and added sugar. Did we mention they are also deliciously creamy? 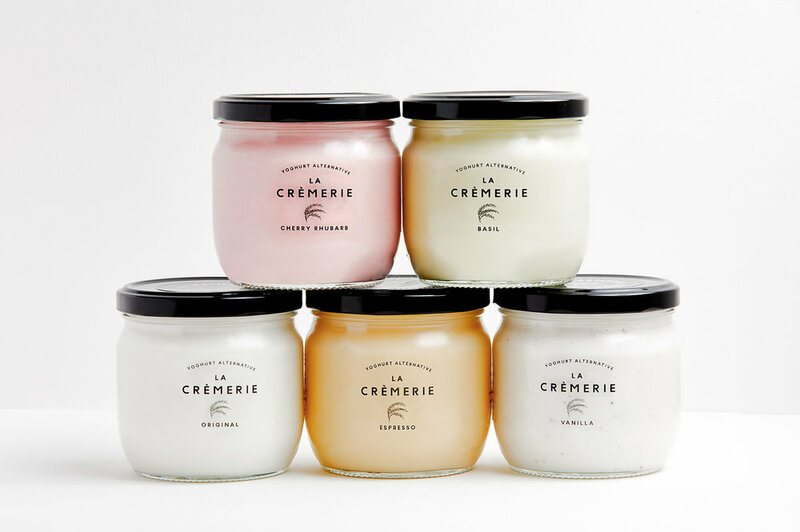 La Crèmerie is one of East London's latest innovative food startups, founded by Canadian fashion-designer-turned-entrepreneur Renée Lacroix. After several diet transitions (from omnivore to flexitarian to vegetarian to now mostly vegan), she found herself dissatisfied by the lack of dairy free yoghurt options available on the market. Crèmerie is a French word meaning 'dairy shop', a place where people would traditionally go to stock up on fresh produce such as milk and cheese. We love dairy cows, but we don’t need them to make our products. Our mission is to reduce dairy consumption by offering tasty and healthy plant-based alternatives. To Help REDUCE GLOBAL DAIRY CONSUMPTION BY OFFERING DELICIOUS, HEALTHY & ETHICALLY-SOURCED ALTERNATIVES. You've asked for it, we made it happen. Wherever you are in the UK, you can now order your favourite flavours right here!